Our group was treated to an excellent talk last night by Kurt Schlichter, who gave us the military perspective of our threats from foreign and domestic enemies. His admiration of today's military, including their devotion to their duty, was welcome news to everyone there. 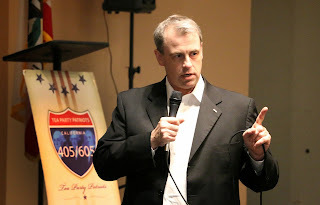 At times his presentation was lighthearted, his levity softened some of the crazy remarks coming out of D.C.
Patriots, thank you for supporting the 405/605 Tea Party Patriots. Please bring as many young people to our meetings, it is their future that is at stake! Constitutionally Limited Government, Free Markets, Fiscal Responsibility.